The helicopter’s rotor blades struck electrical wires while attempting to land in a field last July to collect a casualty. THE AIR ACCIDENT Investigation Unit (AAIU) has recommended that the HSE expand the use of Tetra radios to paramedics involved in aeromedical incidents after an air ambulance was substantially damaged during a rescue operation. An Air Corps air ambulance was tasked with the transfer of a casualty in June last year from an ambulance in Tipperary to Limerick Regional Hospital. On approach to landing in a field, and shortly before touchdown, the helicopter’s main rotor blades struck overhead electrical wires and severed them. This wire impact caused severe airframe vibration and a momentary oscillation of the helicopter, forcing the pilot to carry out an immediate forced landing, which was heavy. He shut down the engines and the crew exited safely and uninjured. As there was “substantial damage” to the helicopter, the patient was transferred to hospital by road. During the investigation that followed the incident, the pilot said that the wires “came out of nowhere” and that once he saw them he instinctively applied power and pitched the nose up in an attempt to avoid them. 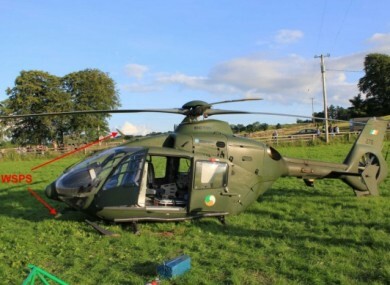 A garda who was at the scene for traffic control and witnessed the incident said that the pilot “did some job” to land the helicopter though he did observe that the pilot seemed to lose control at one point. The investigation report found that the helicopter had been properly maintained and that the main contributory cause was that neither the pilot nor the crew saw the wires until it was too late. It also found that the advanced paramedics on the ground, who had observed the wires prior to approach had no means of direct communication with the crew to alert them to the potential hazard. The report recommends that the HSE should expand the use of Tetra ratios to paramedics involved in these kinds of operations to address this. It also recommends training for paramedics on potential hazards for helicopter landings and a review of Air Corps procedures. Email “'Substantial damage' to air ambulance during rescue operation”. Feedback on “'Substantial damage' to air ambulance during rescue operation”.